Born in Boston, Massachusetts, Brenda continues to live in her Roxbury community. As a volunteer, she contributes her skills and expertise to numerous non-profit and community- based organizations. Before advancing into freelance projects, she worked at Harvard Smithsonian Center for Astrophysics as a program administrator. Now, as an advocate and social entrepreneur, Brenda applies her insight, resources and expertise from a varied career in government, industry and education to bring about new possibilities. Concerned about health outcomes and quality of life disparities in communities of color, Brenda focuses on living our best lives as we age. She works with groups to sponsor healthy aging events, strengthen social connections and maintain a sense of purpose. 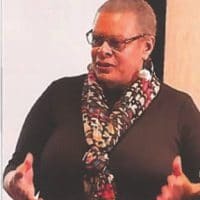 Recent projects include events and advocacy through AARP Massachusetts, art for people in the early stages of Alzheimer’s and Dementia with Memory Cafes Massachusetts, healthy African heritage cooking with Oldways.org and intergenerational “homesharing” through Age-Friendly Boston and Nesterly. Brenda participates in several advisory committees including the Mayor’s Advisory Council on Aging, Massachusetts Healthy Aging 2018 Data Report, National Center for Creative Aging, the Bates Art Center and the Governor’s Council on Aging Technology Workgroup. She believes that older adults are a vital part of community and is committed to doing her part to change the narrative to bring about the best possible outcome for the future of aging and longevity. A lifelong learner, Brenda holds a M.Ed. in adult education from Antioch University and a B.A. from UMass Boston. She returned to UMass to study Gerontology at the McCormack Graduate School of Policy and Global Studies and recently completed the Senior Civic Academy as part of Age-friendly Boston. She is also an avid online student, participating in many MOOC courses. She recently participated in a group exhibition at MOMA as a member of their online learning community.